Alternative dining in Dubai is all about fantastic culinary experiences that stay with you. Discover unique restaurants in Dubai that offer delightful dining for all types of foodies. Imagine sitting at the largest aquarium in the Middle East, having the most opulent dinner (or “underwater” afternoon tea) surrounded by 65,000 of your favourite marine animals. 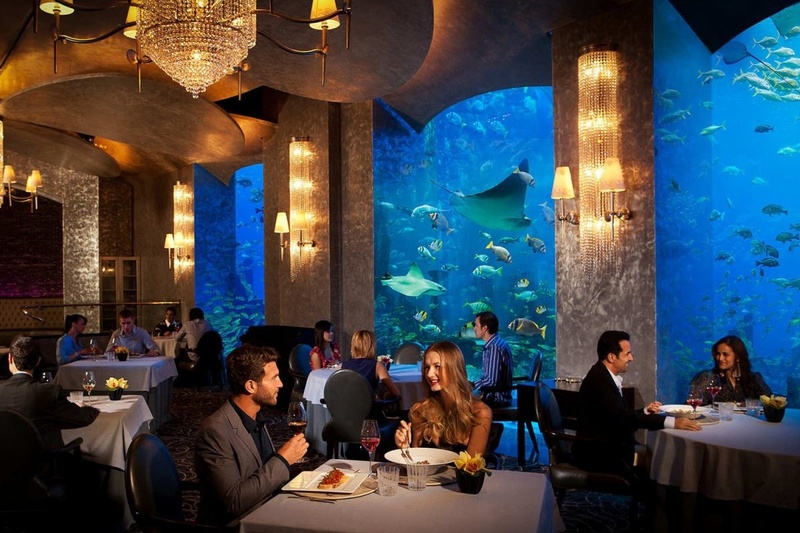 At the opulent seafood restaurant Ossiano, you’ll get the kind of Dubai experience worth bragging about. insydo tip: The experience is as expensive as it sounds. Call ahead and find out about timings, if any, for the next scheduled aquarium feeding. The best way to experience the culture of Dubai and cuisines of the region is by taking a food tour with Frying Pan Adventures. You’ll visit markets, meet local chefs and indulge in street food around the city’s old souks. From Emirati snacks to Palestinian falafel, it’s an intimate way to explore Dubai’s foodie history. insydo tip: Hop aboard the Dubai Metro for a unique food tour that will let you sample cuisines around lesser known neighbourhoods in the city. Think you know Indian cuisine? At Carnival by Tresind, toss away all of your assumptions as you explore gastronomic delights that almost feel like art on a plate. Sample modern Indian dishes that push boundaries in every sense… and be prepared for exceptional presentation and impeccable flavours. insydo tip: Get the most out of your culinary experience by opting for the Chef’s menu or Friday brunch. Make the most out of your foodie passions by exploring more of Dubai’s most popular culinary experiences.